Few days ago, news had it that UC Browser was removed from Playstore because of a setting in the browser itself or misleading promotions which are the reasons why Google unpublished the browser from the Playstore. No doubt, UC Browser is a well known browser which has grown to be the most used browser in India. UC Browser is massively popular with over 500 million installs on the Playstore which is a great figure. 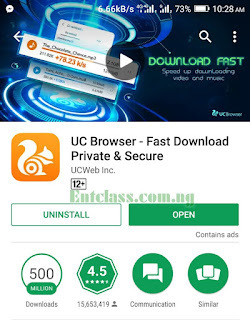 The misleading promotions and/or ads are said to be a malicious redirecting adverts that were being used to increase downloads for UC Browser which is against Google Playstore policy. Google detected the malicious ads on UC Browser and decided to unpublish it from Playstore. Even a Twitter user, claiming to be a UC Browser employee, also said misleading ads were to blame. "We were informed by Google Play about temporary removal of UC Browser from the Play Store for 7 days, beginning 13 Nov 2017, under the reason that a certain setting of UC Browser is not in line with Google’s policy. We have conducted an urgent internal investigation and fixed the problem. The new version has been uploaded on Google Play's Developer Console and is awaiting evaluation. We will actively cooperate with Google Play for any concern caused by this unintentional error. In the meantime, users can still download UC Browser Mini from the Play Store, an alternative version of UC Browser. We thank Google Play for their understanding and support extended to us. UC Browser new product package will be back on Google Play next week and, in the interim, users and partners can download the product from our website http://www.ucweb.com." Now, the latest news is, UC Browser has returned to the Playstore. Google has published the Browser on the Playstore. You can download from below links. Download UC Browser - ApkMirror. Well I didnt know about these problems but I know ucweb is a vey fantastic browser. Glad the isue has been fixed. Good updates, Thanks for sharing this with us.